Maggie and Jordan first met in high-school. They had a history class together. They have been together for 6 years in May of 2017.Their first date was to Max and Erma's for dinner, because she demanded that he take her out. They were packing up Fourth of July weekend to go visit Maggie's family. He took a ring that she normally wore and made her feel crazy all morning thinking the kittens took it off the counter. Then finally she gave up and excepted that the ring was going to be gone. Then, he asked if she had found the ring; she of course had not, so he asked if she would try this one instead. Of course, it was the engagement ring. Maggie and Jordan were married on September 16th, 2017. The day started off with Maggie and the girls and Jordan and a few of the boys getting ready at Marriott in downtown Akron, Ohio. From there, we went to the Prince of Peace Church in Norton, Ohio for the ceremony. After the ceremony, we did family formals in the church. Then, we left the church and headed to Canal Park in Akron, Ohio to take bridal party photos (which was unique and a ton of fun). Then, we headed to Tangiers in Akron, Ohio for their reception. 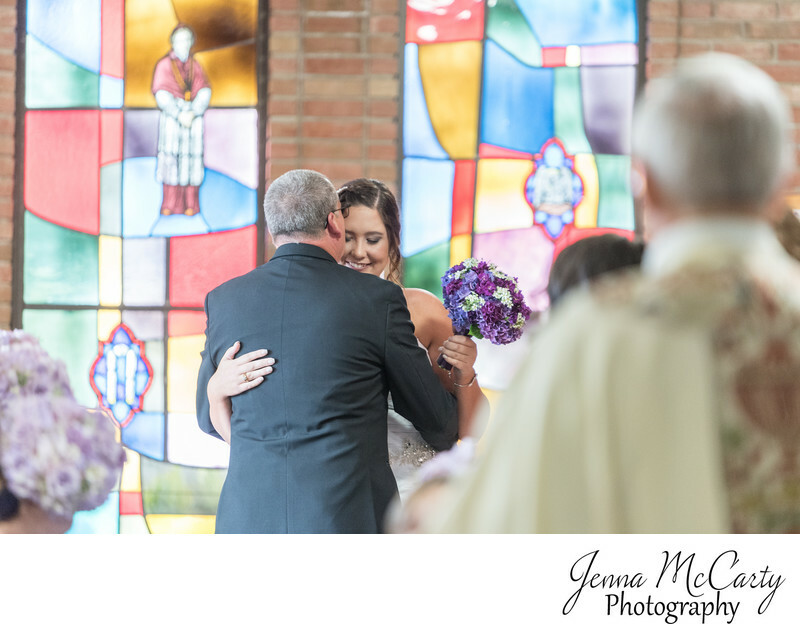 This photo features a sweet moment between the bride and her father before they walk down the aisle. Location: 1263 Shannon Ave, Barberton, OH 44203.